The John Wall telescope is a 30-inch f/12 refractor. In the entire 400-year history of astronomical telescopes, this is by far the largest refractor (lens telescope, as distinct from a reflector, which uses a concave mirror to do the same job) ever constructed by a single individual. Even today, it ranks as the equal-5th largest refractor anywhere in the world - the largest being only a 40-inch - and the largest ever operated in the British Isles; the last time another refractor as big as this was built (the Thaw photographic telescope, Allegheny Observatory, USA) was in 1914! The John Wall 30-inch refractor. That 'single individual' is John Wall, telescope maker extraordinaire and inventor of the 'Crayford' eyepiece-focusser. 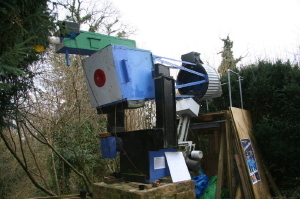 John did all the development of this wildly unconventional approach to large refractor building, the detailed design-work and all its actual fabrication, both mechanical and optical, single-handedly, in a tiny back-garden workshop and mostly using materials commonly available in the engineering and building trades.